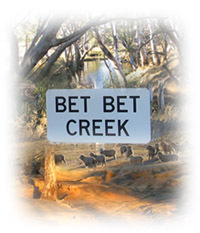 The Bet Bet Creek catchment lies in the south-west corner of the Loddon River catchment. It has been selected as a key catchment for planting trees and other deep-rooted perennial plants to achieve salinity outcomes for the Loddon and Murray-Darling catchments. Parts of this catchment have been chosen as key target areas for salinity works and research within the Loddon catchment. There are a number of projects being carried out in this area. The Upper Bet Bet targeted salinity project, for example, is a joint project with the Bet Bet (Lexton) community, the Department of Sustainability and Environment (DSE) (external link), Department of Primary Industries (DPI), North Central Catchment Management Authority (NCCMA) (external link) and Sinclair Knight Merz (SKM) (external link). This project aims to control salt by minimising salt wash-off and reduce groundwater recharge. To do this requires an understanding of the hydrogeological processes that cause dryland salinity. A key feature of this project is monitoring of groundwater levels, stream quality, saline discharge and land use change. A similar project is being carried out in the Timor West target area. Staff from the Department of Primary Industries (DPIs) Primary Industries Research Victoria (PIRVic) Division are undertaking additional work in this catchment to better characterise landform, soil, and regolith. This is being undertaken as part of a CRC for Plant-Based Management of Dryland Salinity (CRC-PBMDS) project and a North Central region land resource assessment project. Information developed from these projects will be progressively incorporated onto this website.